It's been a rough month for me. Despite being rough, it's been a month of heart healing for me. My back "blew a fuse" a few weeks ago and I haven't been able to do the things that are "therapy" to me, which is art journaling and exercise. What I've found is that a lot of my issues with my back are heart and emotional issues. My mind just said "enough, I need some rest" and despite the physical pain, the mental and emotional healing has been amazing! This past week my chiropractor said something to me that I just knew instantly I needed to journal about. I swear he's like the best therapist/counselor I've ever had. He could tell I had a storm brewing in my heart/life. So he had me think of a hurricane. 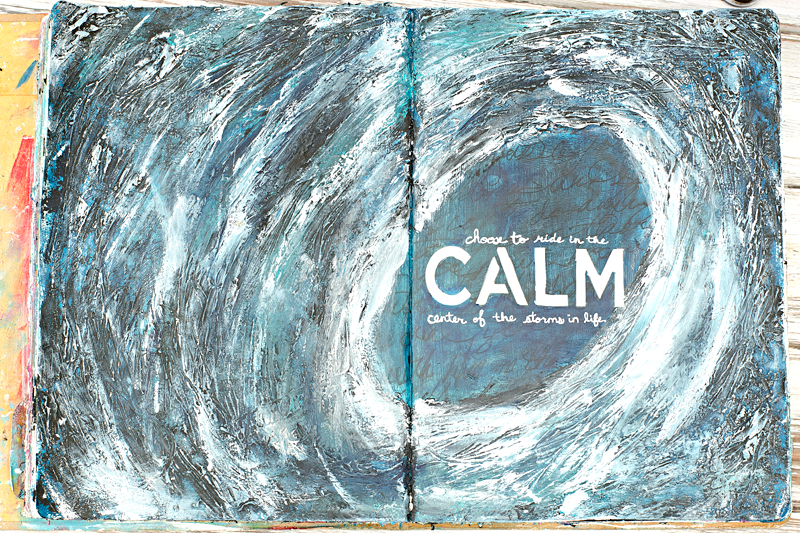 He then had me think about how the center of the hurricane is calm and peaceful. 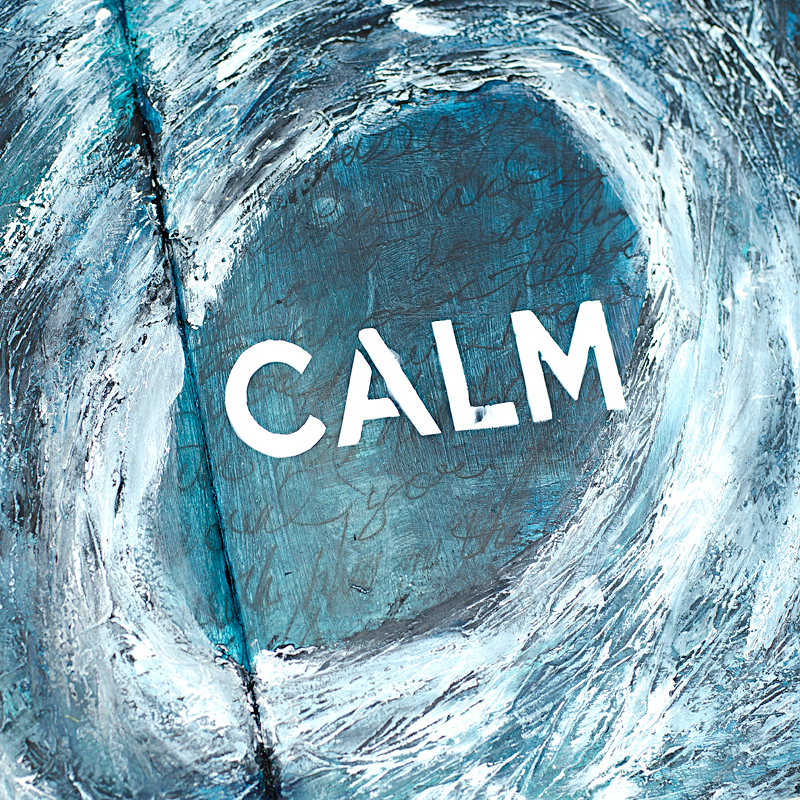 He then said that I had a choice, I could fight the storm and likely drown or never heal, or I can ride the storm in the center where it's calm. WHOA! Seriously, the weight of everything just dropped off my shoulders, I literally could feel my tensed up shoulders drop. 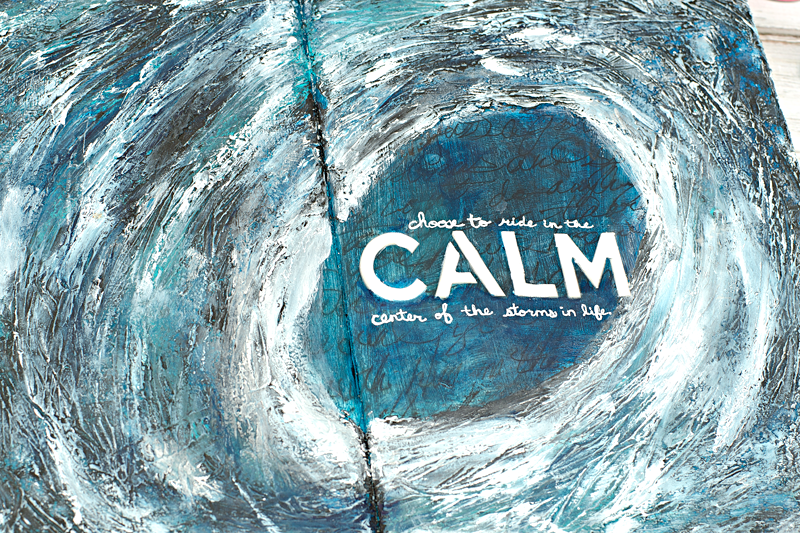 The storms are still around me and there is nothing I can do about them, but choose to ride it out in the calm center. 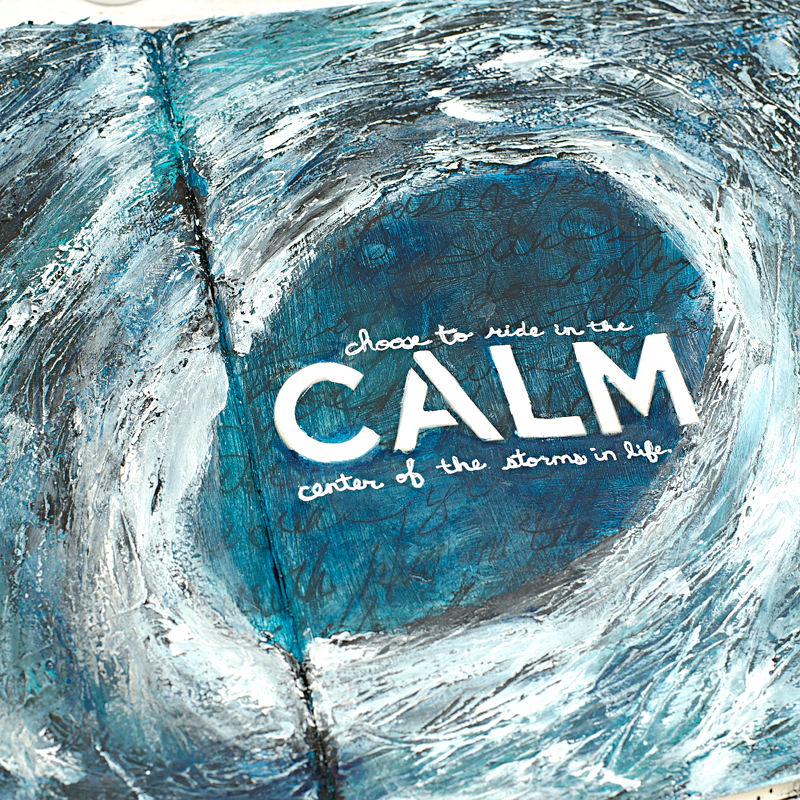 My back has been feeling a ton better and I was able to actually do a little art journaling this weekend, YAY! 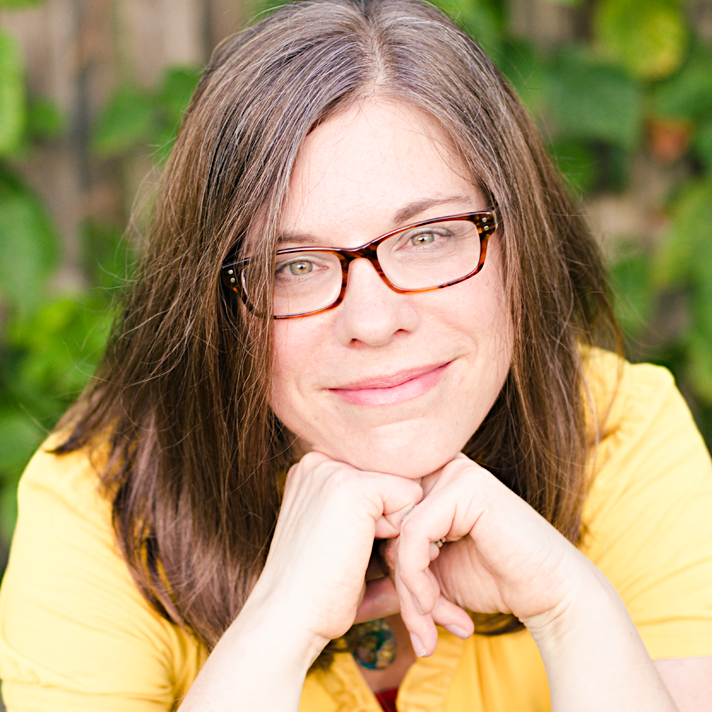 I'm excited to take you though the process of creating this page all about reminding myself to choose to ride in the calm center of the storms. I am really excited to share with you that DecoArt Media products are now available at JoAnn.com and select JoAnn Fabric stores. I love the DecoArt Media line because compared to other fine art fluid acrylics, they are much less expensive with comparable quality. Having them available at my local stores makes it so much easier to go pick up a bottle when I run out in the middle of a project too, so I was super excited about them being available at JoAnns now. 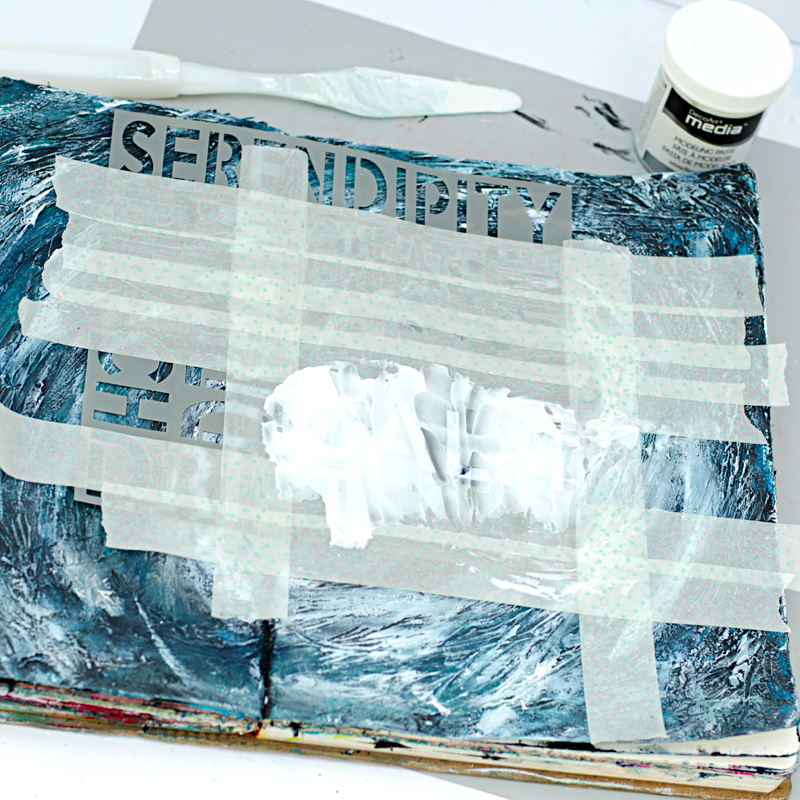 STEP ONE: Gesso the pages, I'm using DecoArt Media Gesso... 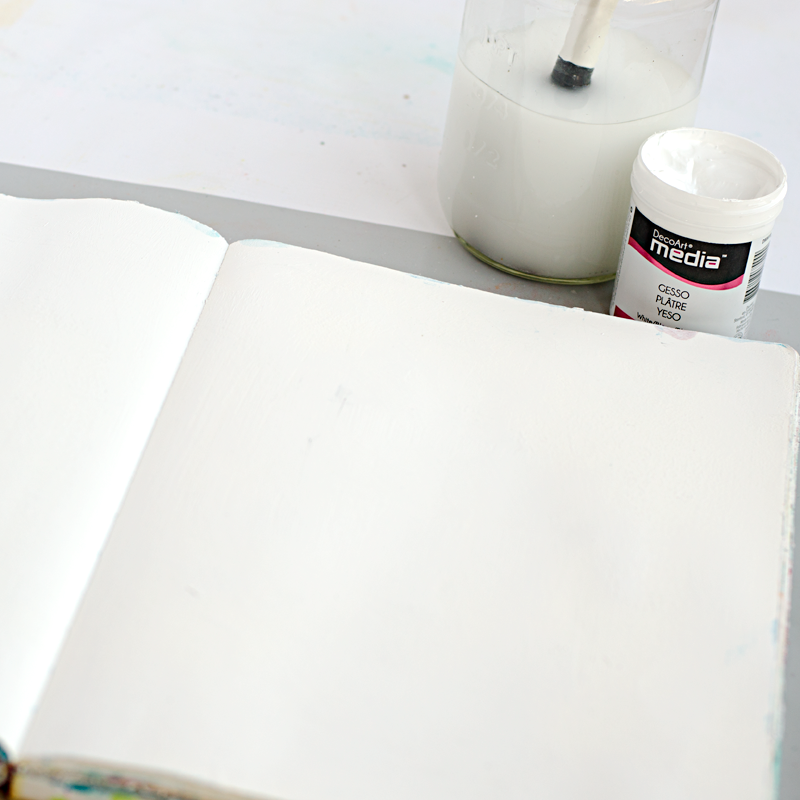 I had a lot of other paint from other pages on it so this gave it a nice coverage and helped prime the pages to use less paint in the next steps. 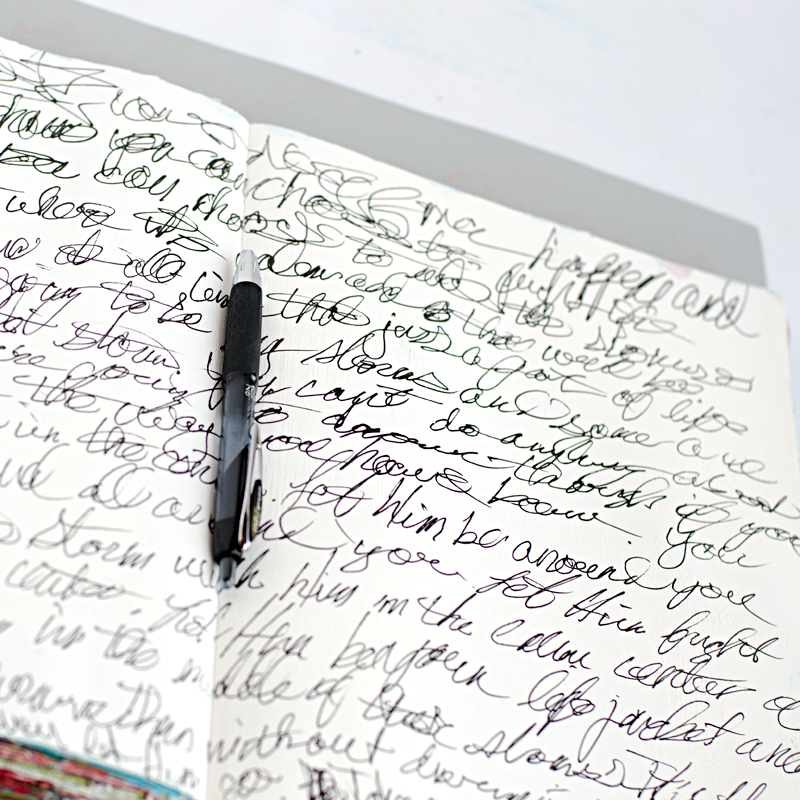 STEP TWO: Using a permanent pen, journal in messy handwriting that only you know what's written. Even though it will be covered with paint, you'll still be able to see it which is part of the fun textures in these kinds of journal pages. 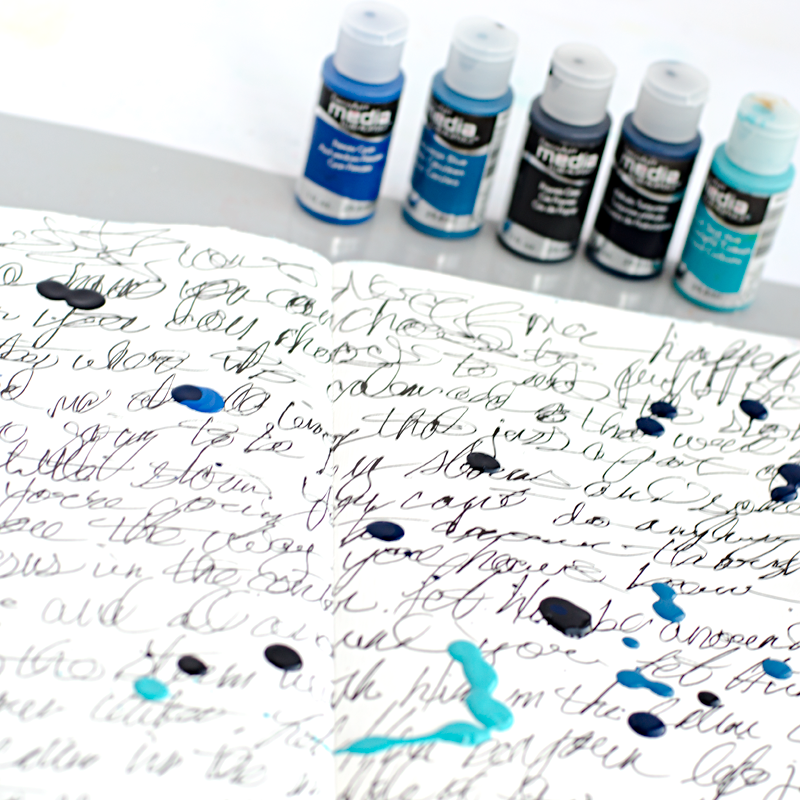 STEP THREE: drop a few drops of fluid acrylic paints in different shades of blues, teals and grays. I'm using DecoArt Media Fluid Acrylic Paints in Cobalt Teal Hue, Primary Cyan, Cerulean Blue, Phitalo Turquoise, and Paynes Grey. 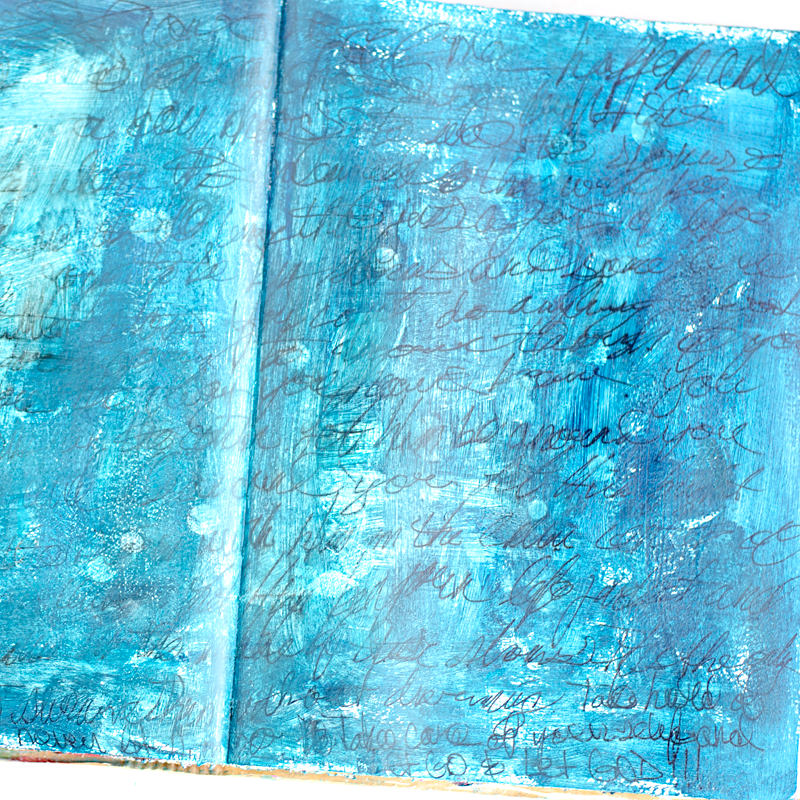 STEP FOUR: using a brush or your fingers spread the paint over your journaling and blend the colors together. 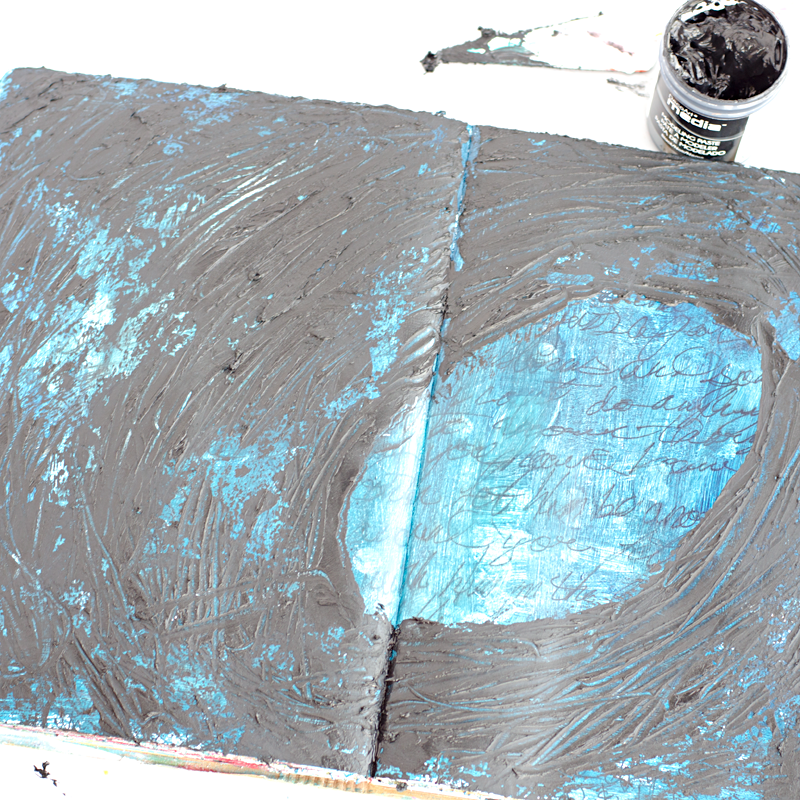 STEP FIVE: using a palette knife and black modeling paste, I'm using DecoArt Media Black Modeling Paste, spread it over your page leaving an oval shape opening. 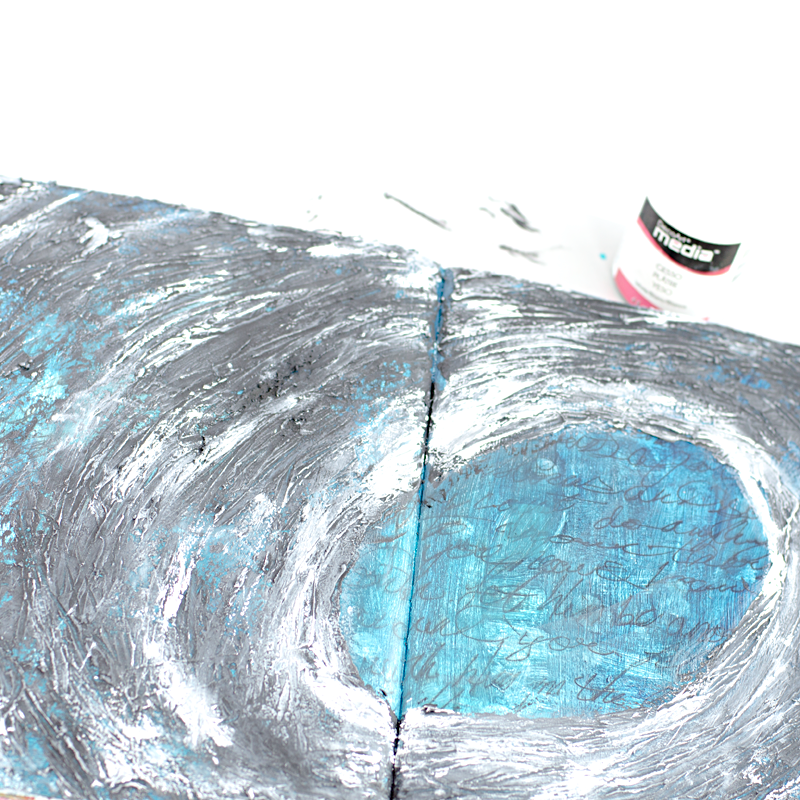 Then take the tip of your palette knife and draw/scrap ovals around the opening to give it texture. Let dry completely before moving to the next step. 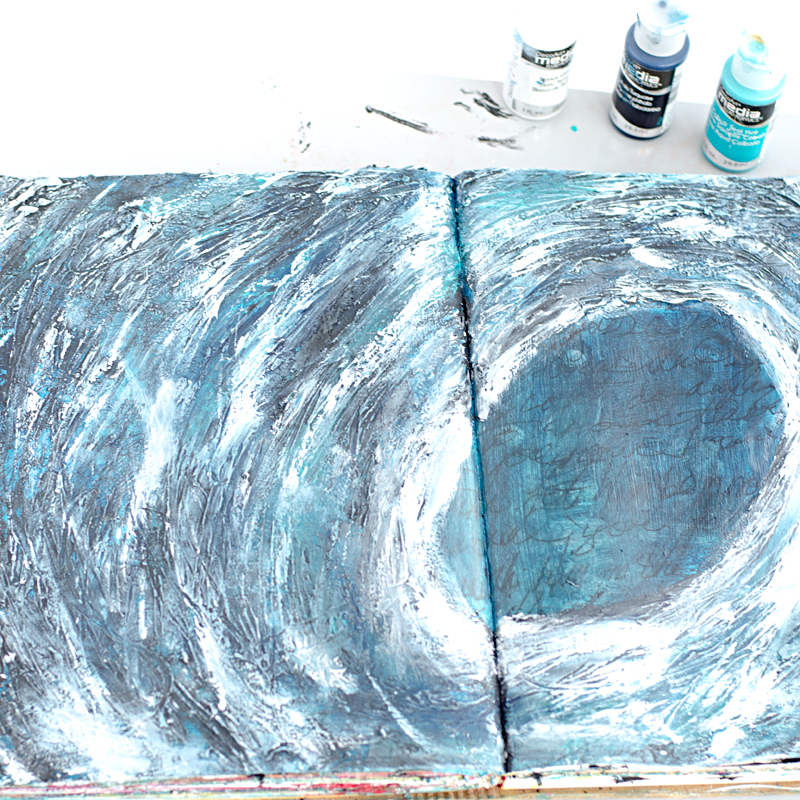 STEP SIX: using your finger lightly rub white gesso over the top of the texture in that same circular motion to mimic the motion of a hurricane. 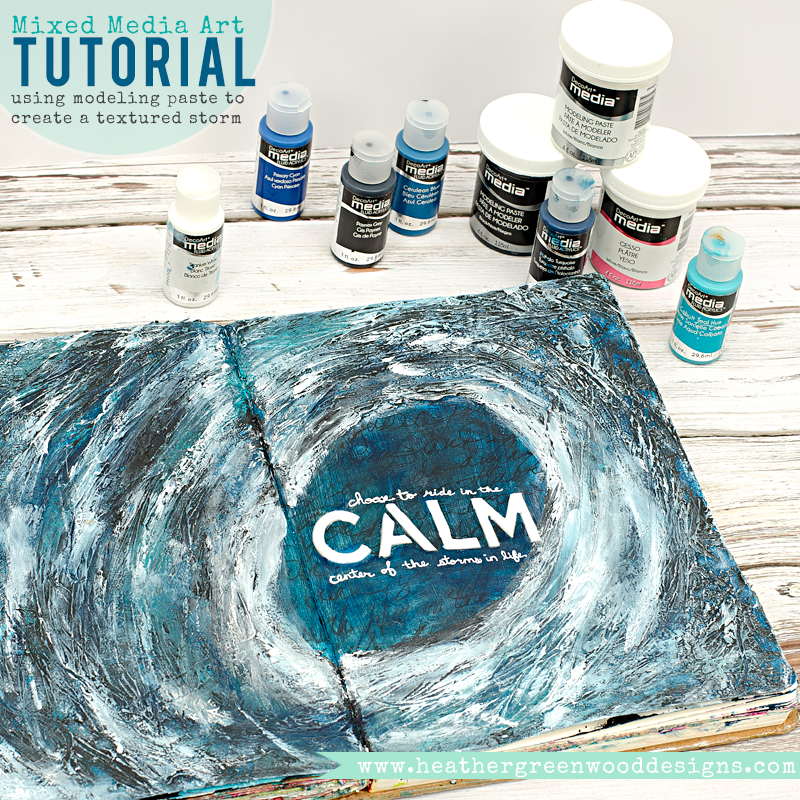 Then do the same thing with some of those teal colors to bring back in the colors of the water. I also did the same technique using some Titanium White DecoArt Media acrylic paint to really make the whites of the waves pop. Let dry completely before moving to the next step. STEP SEVEN: You have completed your hurricane, now to finish it off with a title or phrase. 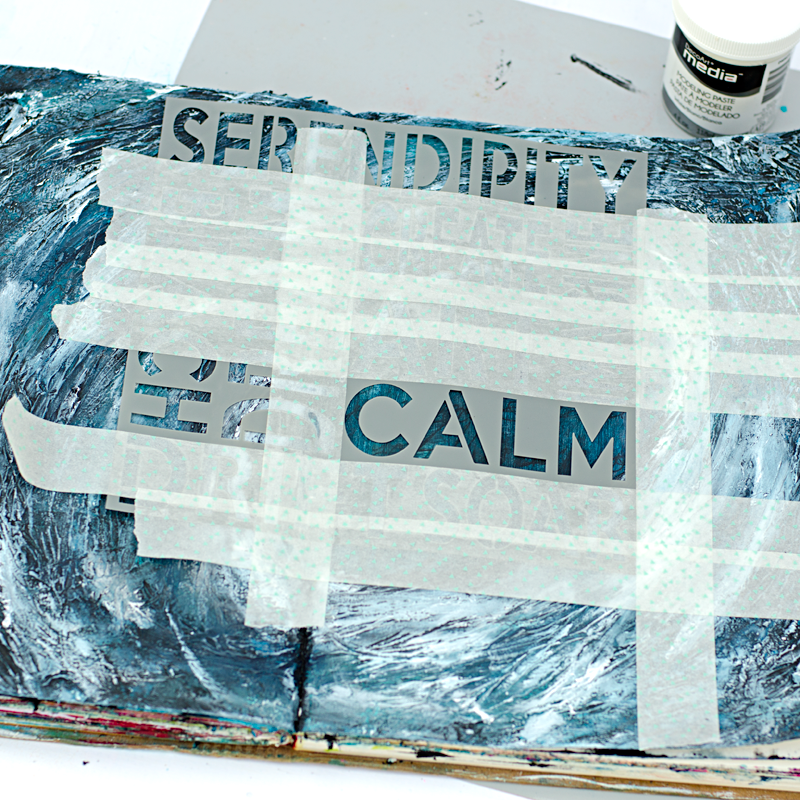 I'm using the DecoArt Andy Skinner Serendipity Mixed Media Stencil and taped off the word "CALM". Be sure to use a low tack tape and that everything is completely dry so you don't ruin your project! STEP EIGHT: using a palette knife, spread some modeling paste thickly over the stencil. Don't let it dry before moving to the next step!!! STEP NINE: Quickly and carefully pull off the stencil and immediately put it in a bucket of water or wash off the modeling paste. You don't want it to dry on your stencils. Then let it dry completely before finishing. NOTE: The modeling paste isn't very opaque when dry, so I took a tiny paint brush and painted over the letters again with the Titanium White fluid acrylic paint. Then to finish it off I used a white gel pen to right the rest of the note to myself. I really love how this turned out. It's a really good reminder to me when I'm struggling or fighting the storms around me. 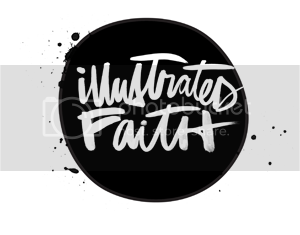 Disclosure: I am a part of the DecoArt Blogger Outreach Program, while I have received some of the products used in this tutorial to be used specifically for this promotion, I've also bought some of them on my own because I love the product and would use them anyways. 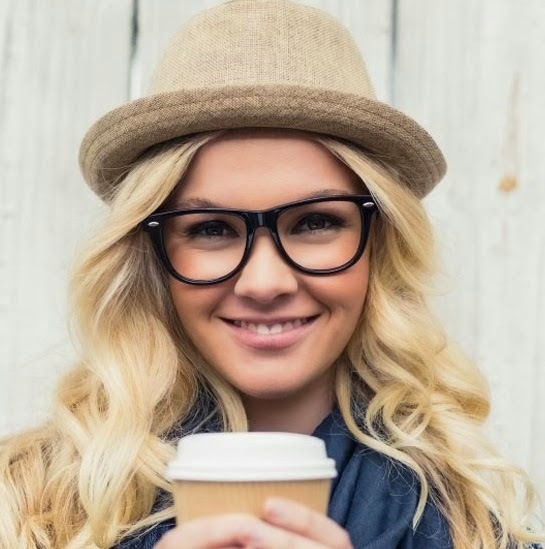 While this is a sponsored post, all excitement and enthusiasm for the product are my own.